Scott's hut, Cape Evans. © Anthony Powell. The New Zealand Antarctic Society is built on creating and fulfilling projects that strengthen New Zealand’s modern and historic links to the Antarctic region. Over the decades the Society has demonstrated its commitment to preserving these links by erecting statues of historic significance, introducing ongoing commemorations and awards and creating a rich oral history archive. Debenham, Gran and Taylor in their cubicle, Scott's hut, Cape Evans. Photo Herbert Ponting. Creative Commons. The Society’s branches regularly initiate special projects to highlight the historic links that bind their city or province to the icy continent. Each year the Society continues a mid-winter tradition, and honours those who have shown their commitment to Antarctica. 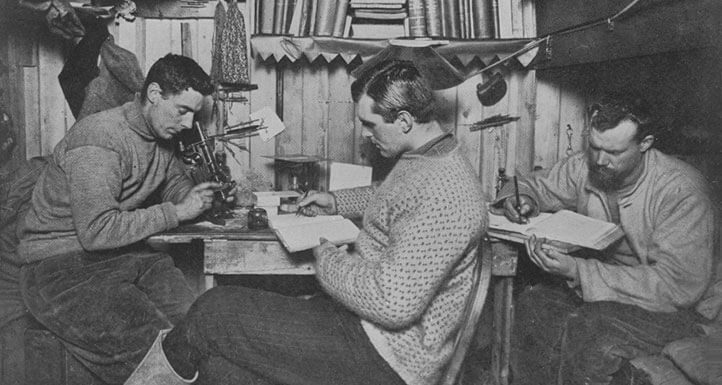 The Society's unique oral history archive provides an important historical review of 1950s and 1960s Antarctica from a New Zealand perspective.